Set within this popular purpose built block is this attractive two bedroom first floor apartment boasting well-planned accommodation, nicely looked after communal gardens and handy allocated parking. Located right on New Brighton promenade, this modern apartment is set in a superb location being close to the great range of services and amenities available in both Wallasey Village and New Brighton including the Marine Point development, Harrison Park, train stations and frequent bus routes. Also perfect for commuting as only a very short drive to the M53 motorway link which leads to either the Liverpool tunnel or towards Chester. Interior: secure communal entrance, inner hallway, living/dining room, kitchen, two bedrooms and bathroom. Complete with uPVC double glazing and gas central heating system. Exterior: aforementioned allocated bay parking and communal gardens. Internal inspection is highly recommended in order to appreciate in full. KITCHEN 10′ 11″ x 7′ 7″ (3.33m x 2.31m) Matching range of base and units with butcher block style work surfaces over. Stainless steel single bowl sink and drainer with mixer tap over, this sits below the uPVC double glazed window. Cooker point with inbuilt extractor above. Space for fridge freezer. Additional space and plumbing available for washing machine. Wall mounted boiler. Central heating radiator, tiled splash backs and complementary tiled flooring. BEDROOM ONE 10′ 5″ x 10′ 1″ (3.18m x 3.07m) uPVC double glazed window to front elevation with central heating radiator. BEDROOM TWO 8′ 10″ x 7′ 8″ (2.69m x 2.34m) uPVC double glazed window to rear elevation with central heating radiator. 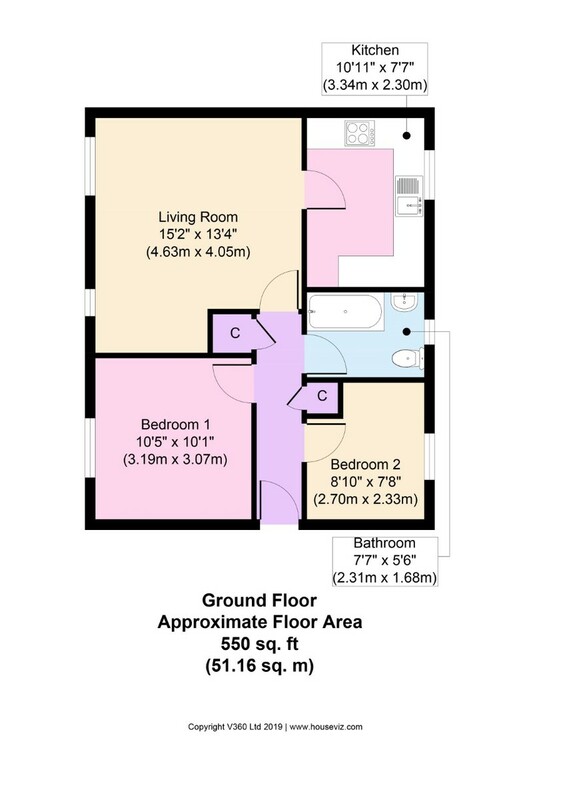 BATHROOM 7′ 7″ x 5′ 6″ (2.31m x 1.68m) White suite comprising panel bath with electric shower over, close coupled WC and pedestal wash basin. Shaving point, central heating radiator and part tiled walls. uPVC double glazed frosted window to rear elevation and complete with complementary flooring. EXTERIOR Well-kept communal gardens with block paving, established planting and mature trees. Allocated parking bays for residents, bin stores and clearly marked visitor parking. INFORMATION There is a bi-annual service charge of £517. There are options for this to be paid monthly if required. LOCATION Dunlins Court can be found off Redcap Close, which is off Smugglers Way, a turning off Sandcliffe Road approx. 1.5 miles driving distance from our Liscard office.